This is a wonderful book but I don't want to tell you anything about it! This could be my shortest ever review. The Secret Rooms is the non-fiction equivalent of A S Byatt's Possession. If you've read Possession you'll know how exciting it was to follow Maud & Roland's research as they pieced together the Victorian love story at the heart of the book. 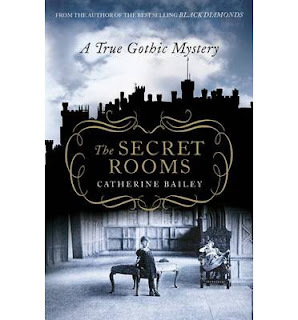 The Secret Rooms has the same feeling of excitement & anticipation as Catherine Bailey researches the mysteries at the heart of her research into a book she had no idea that she would write. Catherine Bailey received permission to work in the archives at Belvoir Castle, the ancestral home of the Dukes of Rutland. The archives were kept in a series of rooms in the servant's quarters, known as the Muniment Rooms. The ninth duke, John Manners, who died in 1940, had dedicated himself to cataloguing & collecting the records, accounts, letters & diaries of his ancestors & his more immediate family. Bailey planned to write a book about the effect of WWI on the families who worked on the estates of the Duke of Rutland. The eighth Duke, Henry, had been instrumental in encouraging the men from his estates to join the battalions he raised & his son, John, had served with the North Midlands. The first mystery that Bailey came across was the attitude of the guides & staff to the fact that she was in the Muniment Rooms at all. No one ever went in there, she was told. The ninth Duke died in those rooms in 1940 & they'd been shut up ever since. This was intriguing. Why had John Manners died in the cold, cramped conditions of the Muniment Rooms when he had a whole castle with his own suite of rooms to lie in? John had refused all medical advice, even from the King's own doctor, to leave. He had something he must finish. Then, Bailey discovered that there were inexplicable gaps in the meticulously kept records. The most unexpected & devastating gap, from the point of view of her book, was that many of the family letters from the First World War were missing. Could they have been misfiled? No, after checking through hundreds of boxes & thousands of letters, the gap was still there. The lack of documentary evidence meant that Bailey was forced to reluctantly give up the book she had planned to write. However, she became fascinated with the life & death of John Manners, the ninth Duke, & this fascination led to the uncovering of family secrets that had lain dormant for over a century. Bailey discovered two more gaps in the records of the family of Henry, the eighth Duke & his wife, Violet. Something had happened in 1894 & then again, there was a gap in 1909, when John was in Rome in the diplomatic service. The removal of material relating to these three gaps was meticulously done & Bailey comes to the inevitable conclusion that it was John who had removed the letters. Was this what he was doing in the final weeks of his life? Was he desperately trying to ensure that nothing remained to be found? The Secret Rooms is as unputdownable as any mystery novel. I was enthralled from the very beginning & read 200 pages in a day. Bailey describes the steps of her research, the dead ends & the other archives & libraries she visits to try to fill in the gaps. Her research is frustrating but also immensely rewarding when she finds out another piece of the elaborate jigsaw. At the same time, she paints a fascinating picture of the privileged life of the aristocracy in the late Victorian & Edwardian period. The extreme wealth of the Rutlands couldn't make them a happy family but I can't say any more! You only have to look at the photos in the book to realise that there is some fundamental grief or unhappiness there. John never looks at the camera, always away to the side or down to the ground. All you need to know is that this is a beautifully written & researched book that will have you propping your eyes open so that you can read just one more chapter before you fall asleep. It's a desperately sad story, compellingly told. I love Trollope & I have great plans to read all his novels - I just don't know how long it's going to take! At least now I have all his novels on my e-reader, so many of the lesser known ones are out of print. However, I do love my OUP editions & I've just read another one from the tbr shelves - The American Senator. This is the story of a few families in the country town of Dillsborough. Contrary to the titles, none of the book takes place in America. As Trollope himself says at the end of the book, it should really have been called "The Chronicle of a Winter at Dillsborough". The Senator of the title is Elias Gotobed, who is visiting England as the guest of John Morton, a diplomat who has spent very little time in his home town for many years. Morton & Gotobed met in Washington, where Morton has also become engaged to Arabella Trefoil, an attractive but impecunious young woman who has arrived at the age where she really should marry. Arabella & her mother are in an uneasy alliance. They don't get on well at all but Lady Augustus knows that Arabella must marry money so they find themselves locked together doing the social rounds, squabbling incessantly. John Morton has now inherited Bragton Hall & returns to Dillsborough with his fiancée, her mother & the Senator in tow. In Dillsborough, there's much speculation about the new Squire of Bragton Hall. There has been a long-ago breach between two branches of the Morton family & John's cousin, Reginald, decides to try to heal the breach when the new Squire arrives at the Hall. Reginald's aunt, Lady Ushant, is also keen to restore family ties but John's formidable grandmother will not budge, even when tragedy threatens. Local solicitor, Mr Masters, finds himself entangled in the Morton's affairs as his daughter, Mary, once lived at the Hall as companion to Lady Ushant. Mr Morton's second wife is not unkind to Mary but she is determined to see her well married & off her hands so she can concentrate on her own daughters. She pushes Mary to marry local landowner, Larry Twentyman, who loves Mary devotedly. Mary likes Larry but she is secretly in love with Reginald Morton & so refuses to become engaged. Meanwhile, Arabella Trefoil is hedging her bets & refusing to commit herself finally to marriage with John Morton in case someone richer comes along. Hunting plays a large part in this novel - it was one of Trollope's passions - & at a meet, Arabella meets Lord Rufford, one of the most eligible & wily bachelors in the county. When the Morton party is invited to Rufford Hall, Arabella begins stalking her prey. She deftly manages to entice Lord Rufford while keeping Morton in reserve, just in case her plans fail. But has she met her match in Lord Rufford who has famously eluded every trap laid for him in the past? Senator Gotobed, meanwhile, is observing English society & he's not impressed by what he sees. 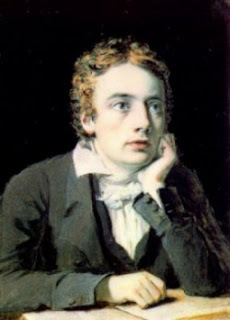 His function in the novel is to expose all the ills of society. The inequalities between the farmer & the lord who can send his hunt over another man's land without recompense or permission. The irregularities of the electoral system. The fine distinctions between families & their social position based on mistakes made by their ancestors years before. I admit, I found the Senator tedious & wished he would go back to America so I could get back to the far more fascinating adventures of the Mortons, Arabella, Mary & the Ruffords. Mary's story is conventional & it wasn't too hard to see who she would marry. Arabella, on the other hand, is one of the most exciting heroines (or anti-heroines) I've come across in Trollope's novels. Trollope obviously disapproved of her. He wrote, "I wished to express the depth of my scorn for women who run down husbands, - an offence that I do fear is gaining ground in this country." However, even the author's disapproval can't prevent Arabella being the most vital character in the book. I genuinely wasn't sure until the end who she would marry. Arabella is like a more canny Lily Bart, intelligent enough to play the cards she has to win the prize she has set her sights on. Whether she will have her way with Lord Rufford kept me on tenterhooks throughout. 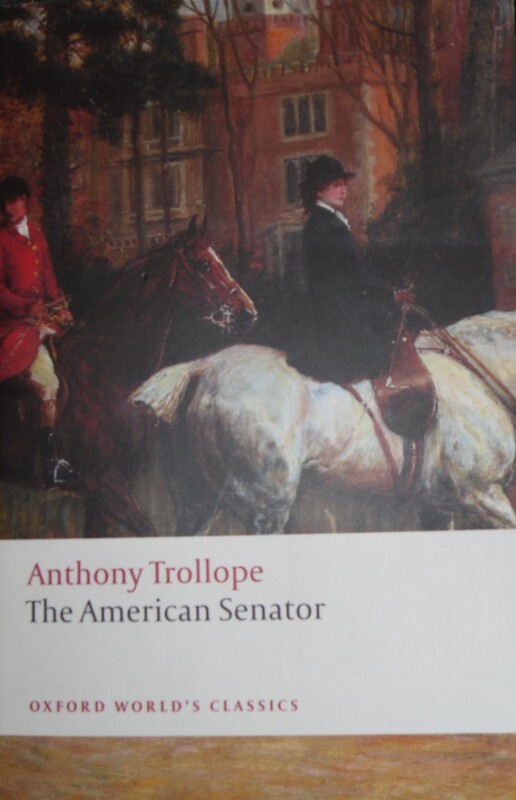 The American Senator is not one of Trollope's better-known novels but I loved it. The character of Arabella lifts it above the conventional country house novel with a romance plot. It's also quite short for Trollope, only 550pp, which isn't as daunting as some of his other novels. 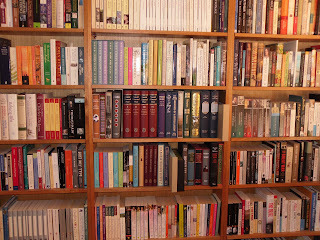 I've read 17 of Trollope's novels now - only 30 to go! 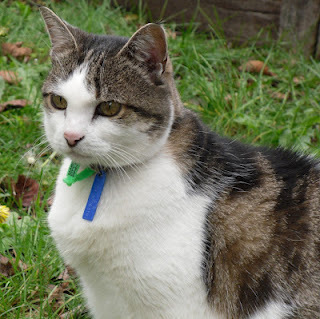 It's two years today since my much loved cat Abby died. So, here's a sonnet by Keats about Mrs Reynolds' Cat. Abby wasn't really very much like this cat who seems to have spent his life killing mice & getting into fights but it's an affectionate tribute & that's what's important. Abby was a timid cat, more likely to spend her days sleeping in her favourite spots in the garden, waiting for me to sit down so she could jump on my lap & being fed the finest tidbits of chicken & fish on offer. Next week, some more Keats with a Barbara Pym connection as Barbara Pym Reading Week gets underway. Serendipity has led me to another book from the tbr shelves. I follow mystery writer Kerry Greenwood on Facebook & she mentioned that she thought John Buchan was an excellent novelist, much better than his contemporaries, & that Mr Standfast was the best war novel & The Three Hostages the best detective story. I have the Penguin Complete Richard Hannay on the tbr shelves so I immediately started reading Mr Standfast & it was certainly an exhilarating ride. 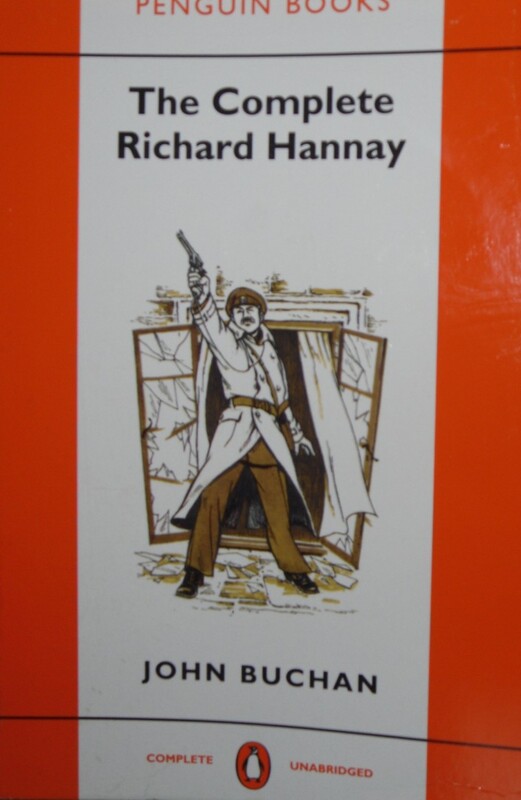 Richard Hannay - soldier, spy catcher, detective - is John Buchan's most famous character. He first appears in The Thirty-Nine Steps, a book that has been adapted for film & television many times since it was published in 1915. Most of the adaptations depart from the book quite a bit I've never understood why film makers do this. (Don't ever get me started on the latest Miss Marple travesties!) so I'd recommend that you read the book first so that at least you can see what they've changed. I've also read Greenmantle, the next Hannay adventure, & Mr Standfast is the third. Mr Standfast was published in 1919 & the action takes place during WWI. Hannay has been serving with his regiment on the Western Front when he is suddenly summoned home by the War Office & given an important mission that will take him out of the front line for a while. He's not particularly happy about this & even less happy when he realises that his role will be as an anti-war peace activist. His old Intelligence boss, Bullivant, sends him off to stay at Fosse Manor near Isham to get a lead on a very dangerous man, Moxon Ivery - or at least, that's what he calls himself. Hannay has assumed his old alias, Cornelius Brand, & while at Fosse Manor, he meets Mary Lamington & falls instantly in love. Mary, however, isn't just the token love interest. She's part of Bullivant's intelligence network & is a bright, resourceful young woman who has a crucial part to play in the narrative. Ivery is posing as one of the anti-war crowd but in reality he's a German spy sending intelligence back to Berlin through an elaborate network of informants & rendezvous in remote locations. I won't even try to describe Hannay's adventures which include dodging the police in the wilds of Scotland after getting himself involved with industrial politics in Glasgow, being trapped in a cage in an impregnable cellar in Switzerland (he shoots his way out of that one in a very surprising way) & trekking over an Alpine pass in the middle of winter in six hours. He even finds himself taking over as director of a war film & using his abilities as a commander of men to foil his pursuers. Every escapade is breathtaking & because the narrative is in the first person, we're right there with Hannay as he makes his discoveries & escapes from his enemies. In between, Hannay returns to his regiment in France & even comes across a lead on Moxon & his cronies at a chateau in Picardy. Hannay's old friends from previous adventures are much in evidence. Blenkiron, the brash American engineer, is now high up in the Intelligence Service & he's the one who explains the background to Hannay & pulls strings for him. Peter Pienaar has joined the Royal Flying Corps & is having a wonderful time as a crack pilot until he is shot down, badly wounded & taken prisoner. The final confrontation between Hannay & Ivery (who reveals himself as the Graf von Schwabing) is a classic standoff between good & evil, highlighted by the fact that Ivery is also in love with Mary (who had been nursing in France) & planning to kidnap her & take her back to Germany. He hasn't counted on the resourcefulness of either Hannay or Mary & his eventual fate is poetic justice. The title refers to a character in Bunyan's Pilgrim's Progress & the book is referred to many times by Hannay, Peter & Mary. Peter in particular becomes absorbed in Bunyan & the Bible during his imprisonment as he comes to terms with his injuries. His badly damaged leg means that he will never fly again. Peter is repatriated to Switzerland & that's where he meets up with Hannay. The scenes between the two old friends are very moving. I have to wonder though whether George Lucas had Peter in mind when he wrote the final scenes of the first Star Wars movie. I was reminded of those scenes very strongly. Mr Standfast is the kind of novel that you race through without getting too bogged down in detail. So much happens so quickly that it's impossible to work it all out anyway. Buchan is always at home in Scotland & these scenes were the most vivid. The Scots characters like Andrew Amos & Geordie Hamilton just leap off the page with their humour & impenetrable dialect. 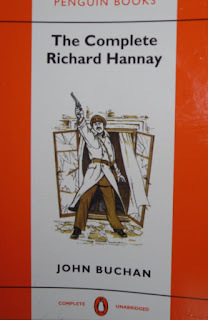 I enjoyed reading Mr Standfast very much & I look forward to reading the last two Hannay novels, The Three Hostages & The Island of Sheep, very soon. Simon Dawson was working as a real estate agent in London when his wife, Debbie, suddenly proposed that they move to Exmoor & run a smallholding. Simon has never lived in the country & hates the outdoors. However, as he had promised to make the move (albeit in a noisy pub when he was half-drunk), he feels obliged to give it a go. The Dawsons sell up in London but Simon has to keep working to make the project financially possible so he lives in a room at his mother's house & continues working during the week, making the trip to Exmoor every weekend. Simon's initial reluctance to make a complete lifestyle change is understandable & the fact that he commutes from London to Exmoor every week means that he finds it harder to become part of the local community. Initially they rent a house with no land but eventually they buy land close to their house & the smallholding begins to take shape. Debbie immediately finds her feet, getting a job as a cook. She convinces a reluctant Simon to keep chickens which they house on a friend's property in return for looking after her poultry as well. Eventually they have pigs, horses, sheep as well as chickens, ducks, geese & a dog called Dex. Simon finds it difficult to reconcile killing & eating animals that he's grown to love - however reluctant he might have been to have any animals in the first place. From his first horrible attempt at killing a chicken & the day when he has to send his first pigs, Black Bum & Spotty Bum, off to the abattoir, Simon soon decides that rearing animals with kindness so they have a happy life is the only way he can bring himself to eat meat at all. He has to learn to contain his rage at the unfairness of Nature when a hand reared pig dies or a fox kills all the chickens. The Dawsons experience a lot of setbacks, especially financially but, after more than ten years on the land, they know they made the right decision to keep trying to fulfill their dream, even when it would have been easier to give up. 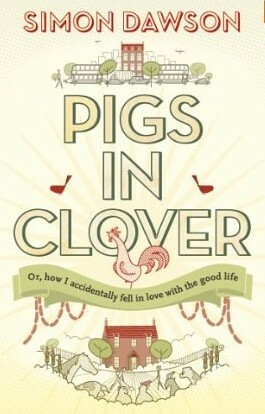 I enjoyed Pigs in Clover with a few reservations. Simon's relationship with his family seems odd, to say the least. It's not until halfway through the book that we learn that the estate agency he works in is owned by his mother & brother, neither of whom are ever named. Of course, it could have been their choice to be anonymous but they're distant, slightly hostile figures all the same. His mother tells him of a reduction in his working hours from full-time to part-time over the phone & finally lets him go altogether in the same way without really having any idea just how finely balanced their finances are or what a devastating effect this will have on their lives. Their one visit to Dorset is a disaster as they just can't understand what the Dawsons are trying to achieve. I would also have loved to have heard more of Debbie's experiences. Alternate chapters about Debbie's life on her own in Dorset while Simon was in London would have been fascinating. We learnt a lot about Simon's many near-death experiences with quad bikes, electric fences & rogue sheep & his philosophical tortures over eating the animals he's grown to love. he even becomes a miserable vegetarian in London because he can't bear to eat animals that haven't had a happy life. I wanted to know more about the work Debbie put in to learning butchery & all the ways she made ends meet. They eventually made a modest living through selling their organic produce at farmers markets & online & Simon became a writer with a weekly newspaper column & wrote The Self Sufficiency Bible which led to running courses on what they'd learnt to others wanting to have a go at self sufficiency. 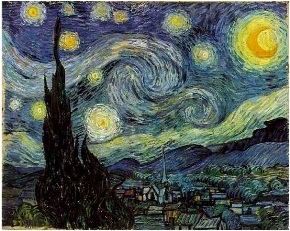 They also made a decision to streamline their tasks so they could become self-sufficient without dying of exhaustion. This became even more important once Simon was living full time in Dorset & their relationship began to suffer because they did nothing but work without ever feeling they were getting ahead. 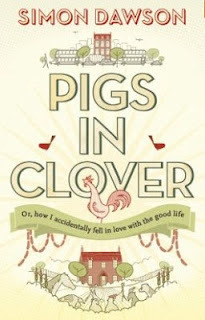 I read Pigs in Clover courtesy of NetGalley. Another poem by Byron which I came across in my anthology & I don't think I've ever read before. It's called On This Day I Complete My Thirty-Sixth Year & it was written only months before his death which makes it even more poignant. 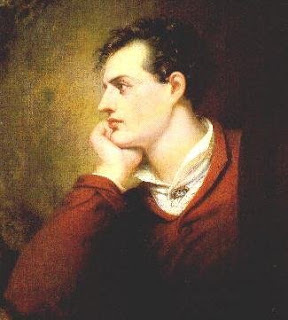 The speaker sounds so weary & melancholy almost as though he foresees his death in a soldier's grave although Byron died of fever rather than on the battlefield. Nevertheless he was in Greece to help the Independence movement even though he had no military experience & he may have been looking back on his life when he wrote this. I have a habit of collecting books by an author but not actually reading any of them. It's on the rainy day principle. 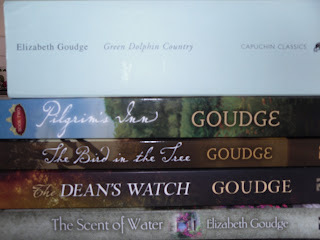 If a long out of print author is suddenly in print again, I rush to buy their books because they may not stay in print very long & I'd hate to miss out on that little window of opportunity when they're available. 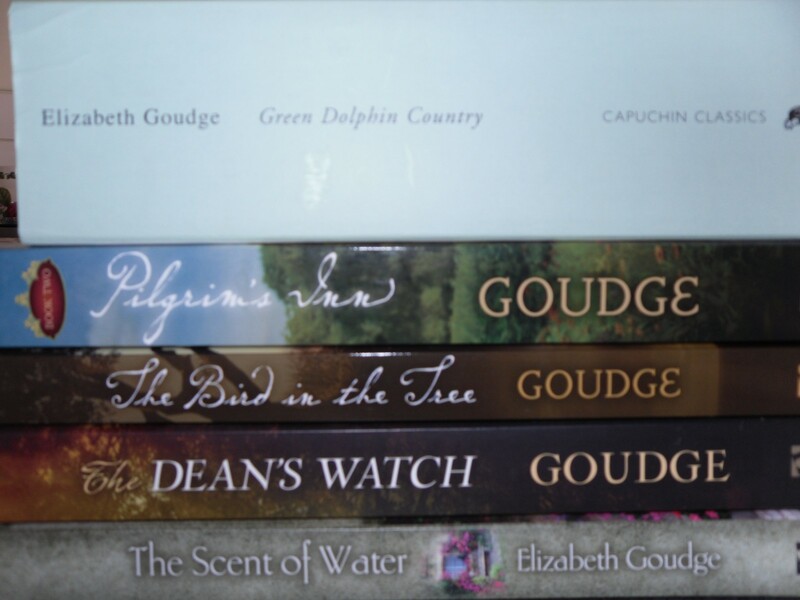 Elizabeth Goudge is the latest author that I'm stockpiling against the day when I'm in the mood for one of her books. and the Eliot Family trilogy, also known as the Damerosehay series. So far they've reprinted Volumes 1 & 2 so no 3 can't be far away. 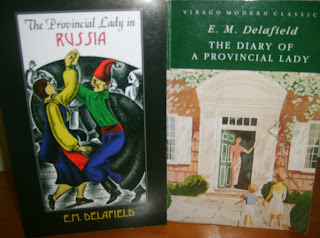 Then there's Angela Thirkell who has many devoted fans in the blogosphere. 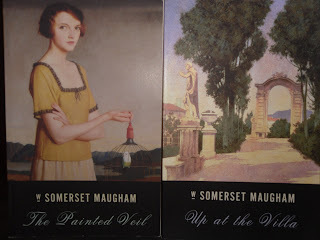 Since Virago reprinted High Rising & Wild Strawberries (with Pomfret Towers to come later this year), there have been many appreciative reviews of her work. I have the Virago reprints as well as an omnibus I bought in a secondhand bookshop years ago which contains The Brandons, Cheerfulness Breaks In & Before Lunch. I have read some Somerset Maugham - The Razor's Edge, some of the short stories - but it was many years ago. 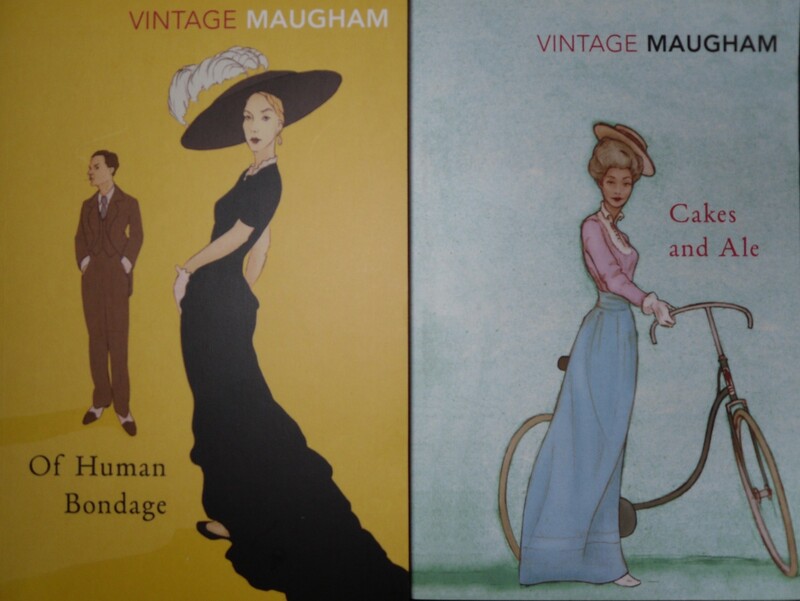 I'm afraid I can always be seduced by a beautiful cover & these Vintage editions are gorgeous. I've also just bought these two lovely Vintage US editions of Up At The Villa & The Painted Veil (now I can't decide which of the Vintage covers I like best...) from my favourite remainders bookshop, Clouston & Hall in Canberra. I've been buying books from them by mail order for over 30 years now. I must have bought hundreds of books from them over that time & they have the most wonderful bargains. 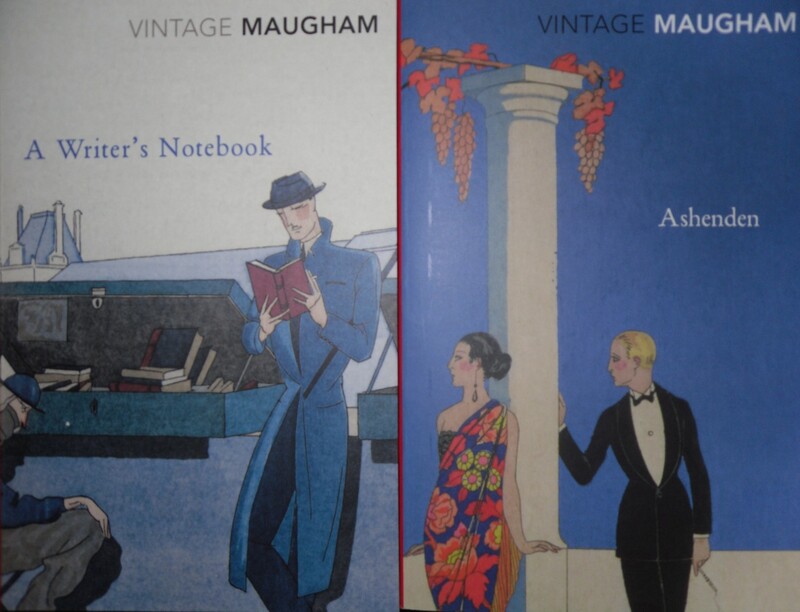 Most of my collection of Wodehouse came from them when the Arrow reprints were remaindered. The links are to reviews of the Maugham books by Simon at Stuck In A Book & Dani at A Work in Progress. 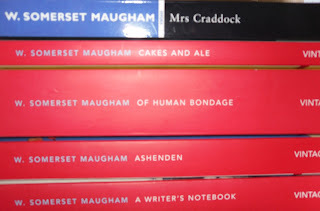 Maybe one day, when I actually get around to reading their books, I'll be inspired to join the Elizabeth Goudge Society & the Angela Thirkell Society (there doesn't seem to be a Maugham Society). If anyone is a passionate advocate of any of these books, let me know in the comments. I just need a gentle shove in the right direction, I'm sure, & I'll be off! Stevie Dunsford is an accountant working in London with an enviable lifestyle & a boyfriend who is eager to get married. Then she gets a call from Cecil who works on the family farm in Devon. Stevie's father has had a stroke & the farm is falling into ruins. The local vet is threatening to prosecute Stevie's father for neglecting the cattle & he's involved in a feud with his closest neighbour. Stevie had reluctantly left the farm when she was 18 after her father refused her the opportunity to work with him because she was a girl. He favoured her brother, Ray, who showed little interest in the dairy business & who has since left the farm. Stevie's estrangement from her father has lasted over ten years & she's only returned once, for her mother's funeral. She wasn't even aware that her father had suffered the stroke. However, she agrees to go home & assess the situation with her boyfriend, Nick. The situation is even worse than she feared. The local Welfare Officer has given Stevie's father, Tom, a deadline to sort out Nettlebed Farm but Cecil is elderly & Tom is unable to do much except sit in the kitchen & threaten intruders with a rifle. He's also not happy & not grateful when Stevie turns up to help. Stevie loves the farm & soon realises that this is what she was meant to do with her life. The mammoth task she's taken on soon consumes her every thought & her niggling doubts about her relationship with Nick soon become overwhelming. Stevie realises that she was always meant to be a lady farmer rather than an accountant & Nick, who is so very much a townie, just doesn't fit in. She grits her teeth & tries to ignore her father's hostility & relies on Cecil & his wife, Mary for support. She also finds the locum vet, Leo, very attractive & although they get off to a bumpy start, their friendship soon looks set to develop into romance. Stevie's hard work slowly begins to pay off & she meets the welfare deadlines for the animals. She begins to relax into her role as lady farmer & starts to build bridges with the neighbours & suppliers that her father has antagonized. She also starts to work on a plan to diversify from dairy & put in place a plan for the long term viability of the farm. Her breakup with Nick was difficult but necessary & her slow burning relationship with Leo looks set to take off. Then, a life changing event puts all these plans in jeopardy & Stevie has to make some hard decisions. Country Loving is a lovely mix of comedy, drama & rural romance. I don't know if it's a worldwide trend but there's been a recent fashion here in Australia for outback romances. the covers are all the same - a young woman, usually blonde with long hair & wearing an Akubra, gazing into the dusty distance with a windmill in the background as you can see here. The setting of Country Loving fits right in to the genre although there's less of the sunburned country & more West Country lushness about the location. What sets this book apart from many of the other novels about women moving to the country is the depth of knowledge that Cathy Woodman obviously has of farm life & especially veterinary work. 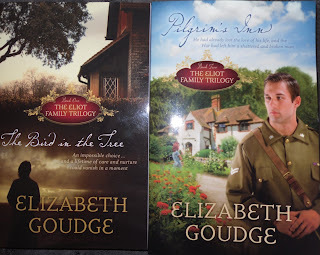 Not surprisingly as she started out as a vet & has previously written a series of romantic novels featuring vets. Stevie has a lot of problems to overcome & the rural setting seemed very realistic to me. Her fractured relationship with her father & the difficulties she faced in fitting in to the rural community were certainly not sugar-coated. Stevie realises that the ten years she spent away from the farm have made some things easier but nothing can overcome the need for hard work, tact & a lot of luck when it comes to dealing with the people of Talyton St George. 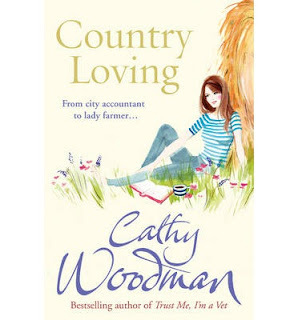 I read Country Loving courtesy of NetGalley. This lovely poem, The Maid of Athens, is by Lord Byron. It's reminiscent of the many poems where the lover describes his beloved as an aid to remembrance or to convince her that she will not be forgotten. Apparently Byron wrote the poem on leaving Greece in 1810 & it was dedicated to the three daughters of his landlady. He described Teresa, Mariana & Kattinka as "divinities" & wrote in a letter that he was "dying of love for them". Somehow I don't imagine Byron pined for very long! My life, I love you.. I've been taking a nostalgic walk down memory lane with Kinsey Millhone through reading this collection of short stories by Sue Grafton. I accidentally left my current book at home the other day & realised I had nothing to read at lunchtime. Thank goodness I work in a library! I saw this among the new arrivals & thought a short story or two would be perfect lunchtime reading. I can remember when I first met Kinsey. It must have been the early 1990s & the first book in the series I read was G is for Gumshoe. I'd read a few other series featuring female private investigators, I particularly remember Sara Paretsky & Marcia Muller (who I'm still reading). I was working at my first library & I must have picked up G is for Gumshoe from the shelves as it was published a couple of years earlier. I loved it & went back to A is for Alibi & read all the earlier books. Since then I've read all the books as they've been published & I see that the next book, W is for Wasted, is due out later this year. The attraction of these books for me is that Kinsey is still living in the 1980s. When the series began in 1981, Grafton decided that Kinsey would age one year for every 2 1/2 books. So Kinsey has aged from 32 in 1981 to her early 40s in the latest books but it's still the 1980s in Santa Teresa, the fictional Californian town where Kinsey lives. She conducts her investigations without mobile phones, computers, the internet or many of the forensic tools available to modern day investigators. She relies on a phone with an answering machine, writing notes on index cards & physically going to government offices or the reference library to look things up. 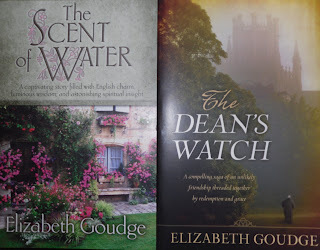 The books have become historical novels which for me is a large part of their charm. 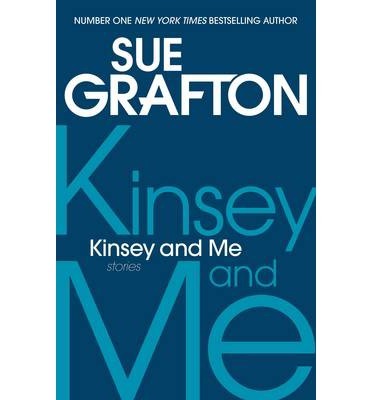 The first half of Kinsey & Me consists of a selection of short stories Grafton has written featuring Kinsey that were published in the late 1980s. For me, the books published in the 1980s & early 90s represent Kinsey's Golden Age. Reading the first story, Between the Sheets, was so nostalgic. A woman is sitting in Kinsey's office telling her that she's found her lover dead in her apartment. They'd argued the night before which several neighbours overheard. She threatened to kill him & had just bought a handgun which she describes in great detail. She didn't call the police but, after finding him shot dead & lying in her daughter's room, she picks up the gun lying beside him, puts it down again & runs out of the apartment,. When Kinsey arrives at the apartment to investigate, the body is gone & there's no evidence that the story is true at all. Kinsey has the case worked out before the police arrive. The charm of this series is Kinsey's voice. The narrative is first person & Kinsey has the wry, amused voice of all the best private investigators. She's not quite the loner that Marlowe & Spade were, though, even though she was orphaned young & grew up living with her Aunt Gin. Twice divorced & wary of new relationships, Kinsey nevertheless has a circle of friends that have become her family. Her landlord, Henry Pitts, is the most important of these but his siblings (all in their 80s & 90s) & restaurant owner, Rosie, all make regular appearances. Here's the opening of another story in the collection, The Parker Shotgun. All the novels & stories begin in a similar way, introducing Kinsey for new readers & making fans settle down with a smile. My name is Kinsey Millhone. I'm a private investigator, licensed, bonded, insured; white, female, age thirty-two, unmarried and physically fit. That Monday morning, I was sitting in my office with my feet up, wondering what life would bring, when a woman walked in and tossed a photograph on my desk. My introduction to the Parker shotgun began with a graphic view of its apparent effect when fired at a formerly nice-looking man at close range. His face was still largely intact, but he had no use now for a pocket comb. With effort, I kept my expression neutral as I glanced up at her. The book opens with an essay about the beginnings of the series & the second half consists of more personal stories Grafton wrote after the death of her mother. I have to admit that the Kinsey stories were the reason I picked up the book & I've had a lovely time reading them over the last week. 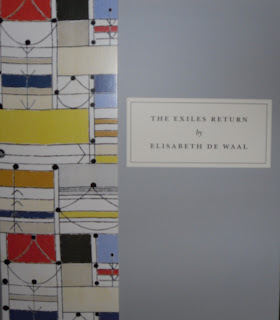 The Exiles Return is a first for Persephone Books. It's the first previously unpublished manuscript that they've published. The author, Elisabeth de Waal, wrote it when she herself was living in exile, in England, where she had lived with her family since leaving Austria in 1939. The exiles of the title have all returned to Vienna in the early 1950s, having escaped before the war. Kuno Adler, a chemistry professor, has been living in America with his wife & daughters. He feels a longing for home that brings him back to a Vienna that he struggles to recognize. Theophil Kanakis has also lived in America & is now extremely rich. He returns to Vienna determined to recreate something of the glorious past by restoring an 18th century house & filling it with antiques. On his return he meets beautiful but shallow Prince Lorenzo Grein, known as Bimbo, & begins a relationship with him. Bimbo & his older sister, Nina, lost their parents to the Nazis & spent the war in hiding in the country. Nina is about 30, a serious young woman who has spent the war years looking out for Bimbo. Now, she's working as an assistant in the laboratory where Kuno Adler also works. Marie-Theres Larsen was born in Vienna but left as a child in the mid 1930s when her parents emigrated to America. Marie-Theres, known as Resi, is now 18 & she has always felt out of place in America. Her younger siblings were born there & have grown up as Americans. Resi's parents are concerned about her lack of interest in anything America has to offer so they send her to Vienna to stay with her aunts, her mother's sisters. The Exiles Return is a fascinating exploration of what home means to different people. I was particularly drawn to Kuno Adler's story. The opening chapters of the book describe his journey homeward. His uncertainties about his decision are beautifully articulated by his thoughts as he sits in the train taking him closer to Vienna. He has become estranged from his wife, Melanie, who has embraced America & its opportunities. Melanie is sure he will be disillusioned & his return is certainly not easy. Although Adler is entitled to return to his previous job as a research scientist at the same level, he finds that his welcome isn't assured. He is resented by the new head of the laboratory who stayed in Austria during the war & worked for the Nazis. The working conditions & equipment can't compare with what he had in America. The younger staff see him as a dinosaur & everyone is apprehensive as to what attitude he will take. Will he expect to take over? Only the old caretaker, Grasboeck, greets him with pleasure. Nina Grein quietly begins helping him with his private research although he barely notices her. Professor Adler's loneliness is increased as he realises that he doesn't know his old friends any more. Those who stayed in Austria during the war, were they collaborators or cowards? Did they take advantage of those who had fled or been imprisoned? He begins taking long walks in the suburbs & countryside to try & reacquaint himself with his home. Resi first goes to stay with her aunt, Countess Lensveldt, at her schloss in the country. Aunt Franzi is welcoming & Resi enjoys the slow life, talking to her cousin, Hanni. She also meets Lucas, a student lawyer whose family have been servants of the Lensveldts for generations. he has an ambivalent relationship with the family. He grew up playing with Hanni & her brother, Franz, but he's not on the same social level. Lucas is immediately attracted to Resi & pursues her without much success. When summer ends, Hanni goes to Vienna to work as a secretary & Resi goes with her to attend classes at the university. The girls stay with their aunt Fini, a widowed Baroness who lives in a tiny flat with a single servant. Kanakis creates a salon in his 18th century palais. He likes being surrounded by young people & Resi, Hanni & her fiance, Georg are invited to parties there through Hanni's friendship with Bimbo. Resi becomes infatuated with Bimbo although he shows no interest in her & Lucas continues to pursue her. The tragedy described in the Prologue is inevitably drawing closer as the naïve Resi becomes more involved with Kanakis & his circle. I enjoyed The Exiles Return very much. I found some characters more sympathetic than others & Professor Adler's story in particular seemed to me to be closest to the author's heart. Maybe because we experience so much of his life in Vienna through his thoughts & reactions. He was such a complex character, self-absorbed, lonely, trying to recreate something of his pre-war life while trying to adjust to the changes war has brought to his home. I also enjoyed the scenes at Schloss Wald as the Lensveldts continue to live the country life they've always known, secure in their social position & privilege. Lucas is a symbol of the changes to come with his assumption of equality with Hanni & Franz & his socialist politics. The time in which the novel is set is also crucial. This is the moment, ten years after the war has ended, when the Occupying Powers are about to leave & Austria will have a chance to rebuild. The first post-war generation are about to take up the reins & move the country into the future. 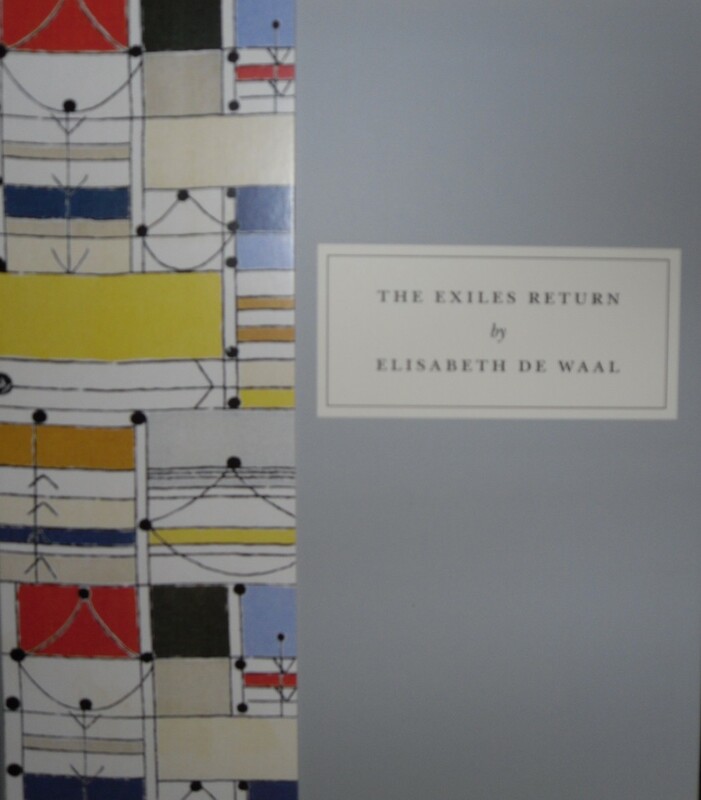 The Preface by Elisabeth's grandson, Edmund de Waal, gives a portrait of Elisabeth & the determination she had to write whether her novels were published or not (she wrote five novels, none of them published in her lifetime). There is something of Elisabeth in all the characters of The Exiles Return, particularly Resi & Professor Adler. So many of her experiences of exile & return are explored in this fascinating novel. I'm so pleased to have had the chance to read it. This is what I love about reading - I learn something interesting practically every time I open a book or click on a website. 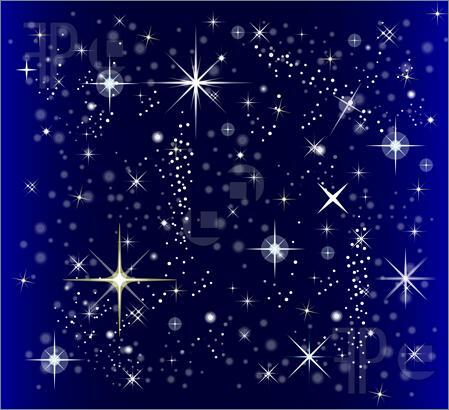 I didn't know the origins of the lullaby, Twinkle, Twinkle, Little Star but I've just come across it in my anthology of Romantic poetry. I suppose if I thought about it at all, I thought it was a traditional rhyme. 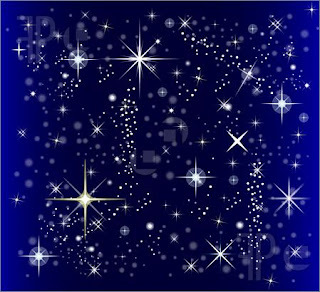 I only knew the first verse & a mangled version of the last so here's the complete poem, called The Star (picture from here)& written by Jane Taylor in 1806. According to The Oxford Dictionary of Nursery Rhymes, Jane & her sister, Ann, published Rhymes for the Nursery in 1806, a very successful volume although this is probably the only rhyme which has survived. I especially like the Mad Hatter's parody in Alice - Twinkle, twinkle little bat!/ How I wonder what you're at!/ Up above the world you fly,/Like a tea tray in the sky. As if I didn't have enough sources of new books & more than enough to read on the tbr shelves, I've recently discovered NetGalley. This is a website that supplies free pre-publication e-books for reviewers, bloggers & anyone who promotes books & reading. I've already enjoyed reading several books from NetGalley including Martin Edwards' The Frozen Shroud & The Creation of Anne Boleyn by Susan Bordo. I've recently downloaded several books to be published over the next few months that I'm very excited about. John Guy is a well-known historian who has written biographies of Mary, Queen of Scots & Thomas Becket. 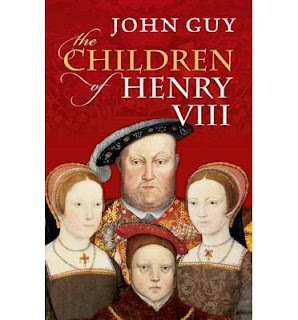 His new book, published in July, is The Children of Henry VIII. As I'm always interested in another book about the Tudors & I've read & enjoyed Guy's other books, I'm looking forward to this very much. March 1912: Twenty-four-year-old Elspeth Dunn, a published poet and a fisherman's wife, has never seen the world beyond her home on Scotland's bucolic Isle of Skye. So she is astonished when a fan letter arrives from an American college student, David Graham.As the two strike up a correspondence - sharing their favorite books, wildest hopes, and deepest secrets - their exchanges blossom into friendship, and eventually into love. 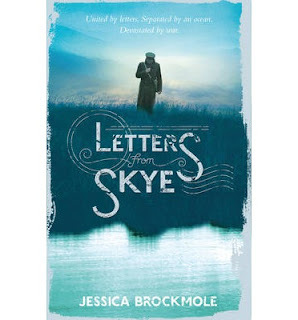 But as World War I moves across Europe and David volunteers as an ambulance driver on the Western front, Elspeth can only wait for him on Skye, hoping he comes back alive. June 1940: More than twenty years later, at the start of World War II, Elspeth's daughter, Margaret, has fallen for her best friend, a pilot in the Royal Air Force. Her mother warns her against finding love in wartime, an admonition Margaret doesn't understand. And after a nearby bomb rocks Elspeth's house, and letters that were hidden in a wall come raining down, Elspeth disappears. Only a single letter, sent decades before by a stranger named David Graham, remains as a clue to Elspeth's whereabouts. As Margaret sets out to discover who David is and where her mother has gone, she must also face the truth of what happened to her family long ago . . . I've always been fascinated by nuns & movies featuring nuns are among my absolute favourites. 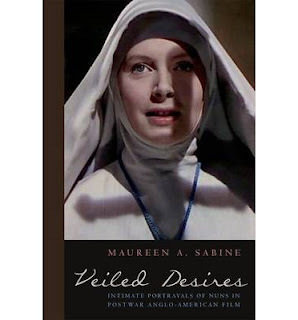 So, I was so pleased to be offered a copy of Veiled Desires by Maureen A Sabine which is published in August. This is an exploration of the way nuns have been portrayed in the movies from the 1940s to the present day. Among the movies discussed are Black Narcissus (that's Deborah Kerr as Sister Clodagh on the cover), The Nun's Story (Audrey Hepburn & the most distinguished cast of Sisters & Reverend Mothers ever seen in a movie, I think - Dame Peggy Ashcroft, Dame Edith Evans, Rosalie Crutchley & Mildred Dunnock), In This House of Brede (Diana Rigg, Pamela Brown & Gwen Watford) & Change of Habit (Mary Tyler Moore with Elvis Presley as a doctor!). And those are just my favourites. Other movies include Heaven Knows, Mr Allison, Sea Wife & The Bells of St Mary's. My only problem is stopping myself from reading all three books straight away! I like to read & review books as close as I can to the publication date so I'm trying to forget that these gems are on my e-reader until it's closer to publication day. Wish me luck!